Haq's Musings: Inside Story: Pakistan Army at the Gates of Delhi in 1965 War? Inside Story: Pakistan Army at the Gates of Delhi in 1965 War? Alas, the core issue of Kashmir still remains unresolved 48 years since Mr. Chavan wrote his words of wisdom. Ae Wattan Kay Sajeelay Jawanon, Amanat Ali,Coke Studio Pakistan, Season 3 from Coke Studio on Vimeo. Operation Gibralter-Preemptive Strike by pakistani forces in Kashmir. At the time of armstice India held more Pakistani territory than vice versa. Also Pakistan's objective of 'taking Kashmir' failed completely. 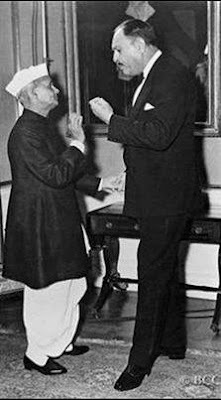 1.Post 1948 India hadn't really focussed on the Pakistani threat or even done anything particularly hostile.Infact the IWT was a sign of goodwill.Post 1965 screwing Pakistan became a priority of the Indian establishment.1971 was a direct consequence of this failed adventure. 2.It dramatically decellerated Pakistani economic progress. 3. It increased allocation of scarce capital to defence partly due to the new 'India threat' which 1965 created. Is such a misadventure really worthy of praise? Riaz bhai, but Pk always lost politically. There are stories that Kargil was a win but it turned out as political disaster. Anyhow, today, I don't think Pk can sustain conventional war with India neither politically nor militarily. Faraz: "Anyhow, today, I don't think Pk can sustain conventional war with India neither politically nor militarily." Let's not forget that Pak won politically when the UNSC passed resolutions supporting Pak position for plebiscite in Kashmir and Nehru accepted before going back. Let's also not forget that Pak did take half of Kashmir which it wouldn't have if it waited. By taking Gilgit-Baltistan, Pakistan became a neighbor of China with Pak-China border which added to its geopolitical strategic position. As to military, most people look at the raw numbers in conventional military strength and decide India is stronger. What R.D. Pradahan's account shows is that when a smaller Pakistani force launched a fierce counter-offensive top stop Indian incursions in 1965, the Indian COAS Gen Chowdhury panicked badly and wanted to withdraw behind the Beas and concede almost all of Indian Punjab to Pakistan. Pradahan shows that soldiers' bravery and human spirit count for a lot. Anon: "Indian counter offensive across LOC"
You have your facts wrong. India crossed the recognized international border attempting to take Lahore in which it failed. Please go through it and see the details yourself to claim one way or other. But you are very impressive and you should go to south asia and help in improving the common people's life. Well? What is our identity? HWJ: "Well? What is our identity?" I really don't care about Pakistan. Doesn't deserve my time or attention. Pls don't lull yourself into thinking all India does is eat breathe dream Pakistan. Instead of writing blogs with one sided depiction of all events, you would do well to re-educate yourself on the colossal blunders by your own armed forces. A good blog is a balanced one not a rant and rave Pakistan is the mightiest nation on earth loose motion. By the way why didn't your JF Junk Fighter turn up in Bahrain? Your new excuse pilot had severe stomach cramps. To date, Khukri is the only ship lost in combat in the history of the Indian Navy. Over 18 officers and 176 sailors were lost in the sinking. The captain, Mahendra Nath Mulla, chose to go down with the sinking ship. He refused to abandon ship, and passed his life-jacket to a junior officer. He has remained so far the only Indian captain to go down with a vessel. He was posthumously awarded India's second-highest military honour, the Maha Vir Chakra. A memorial to the dead sailors exists at Diu. 20°42′10″N 70°58′37″E The memorial consists of a scale model of Khukri encased in a glass house, placed atop a hillock facing the sea. The memorial was inaugurated by Vice Admiral Madhvendra Singh as the flag officer commanding-in-chief. The major Indian gains claimed in terms of area were about 3,200 square kilometres in the Ladakh region under Lt Gen Sartaj Singh and 1,200 square kilometres. under Lt Gen G G Bewoor in the Rajasthan Desert. In both regions these gains lay in farflung, desolate, uninhabited and difficult areas of negligible economic, strategic and political value which could hurt the rulers of Pakistan only in their prestige. On the other hand, Sartaj Singh lost the area of Chhamb, where the aftermath of the refugee problem still haunts the Jammu and Kashmir administration. The loss of the Kasowala bulge, the Hussainiwala enclave and the Fazilka agricultural belt in Punjab could not be equated with marginal gains in the Sehjra bulge and the Mamdot enclave in economic, military or political terms. The Indian occupation of the major portion of the Shakargarh bulge was somewhat embarrassing to the Bhutto government in v ..
Rawlley lost more than he gained in Punjab. The loss of Hussainiwala, the Fazilka cotton track and Chhina Bidhi Chand were inexcusable. The battle in this sector was a peripheral loss and gain of border outposts and nothing more. In a defensive role, the Pakistani army has achieved significant tactical successes. The Pakistani infantry put in a superb performance in the Battle for Lahore in 1965. The Indian army launched a three-pronged attack across a 50-mile wide front towards Lahore at 0530 hours on September 6. The Indian XI Corps, comprising the 7th and 15th Infantry Divisions and the 4th Mountain Division mounted the attack. Within 24 hours the engineers of the Pakistani army had blown up all the bridges on the BRB irrigation canal that lies between Lahore and the border with India. The Pakistani infantry put up a fierce resistance, and were ably assisted by the heavy and accurate fire of the Pakistani artillery. As a result, the Indian attack was halted within a few days. The Indian commander of the 15th Division was relieved of command for an unwillingness to take risks. Within a couple of days, the Indian army launched a full-scale attack with its 1st Corps directed towards the Pakistani town of Sialkot, in between Lahore and Kashmir. This attack was intended to inflict heavy damage on the Pakistan army, and possibly to cut the Grand Trunk Road between Lahore and Rawalpindi. The Indian forces comprised the 1st Armored Division supported by the 14th Infantry and 26th Infantry and 6th Mountain Divisions. 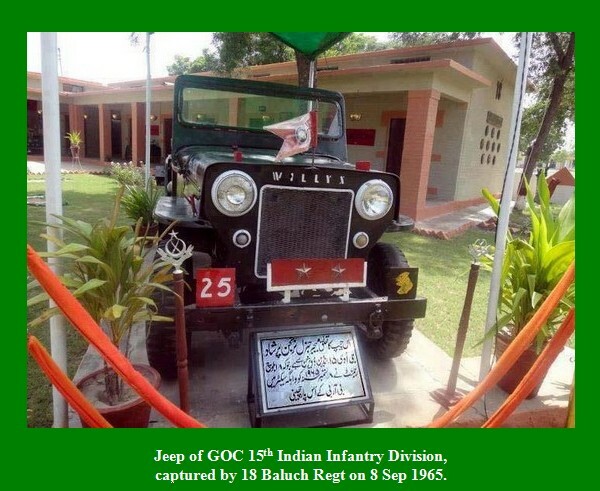 Pakistan’s 6th Armored Division, ably assisted with infantry equipped with recoilless rifles and Cobra anti-tank missiles, halted this attack. 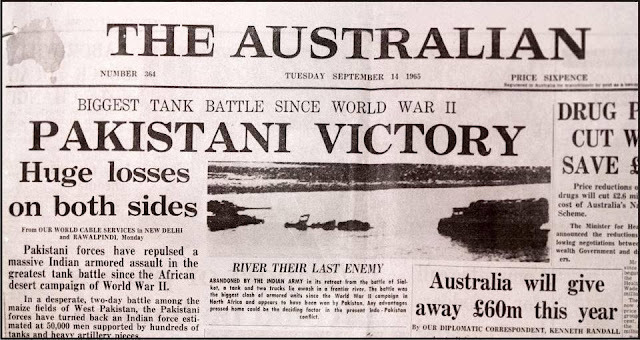 When hostilities ended on September 23, the Pakistanis admitted losing 44 tanks and claimed to have destroyed 120 Indian tanks. Two British journalists who visited the area after the cease-fire confirmed these estimates. In this battle, the 25th Cavalry of the Pakistani army showed that the Patton tanks was very effective in combat against the Centurion tanks of the Indian army. To be sure, Pakistan left a sour taste in their memory. Standing along side a British journalist across the Lahore sector, showing him a swath of captured territory with hurriedly abandoned equipment by the fleeing Indians, one of our Majors made the historic statement 'If they could, the Indians would have purchased courage along with the American equipment'.